Frequent travelers have long been nostalgic for the days when food and drink were complimentary in-flight, but those days are long gone and those amenities -- and the accompanying service -- might be about to get a bit more expensive. Airlines are floating the idea of allowing flight attendants to solicit tips from passengers to supplement wages. For some budget flyers, this concept isn’t new at all. Frontier Airlines introduced a tipping option nearly three years ago, allowing the whole in-flight crew to split tips after each flight. 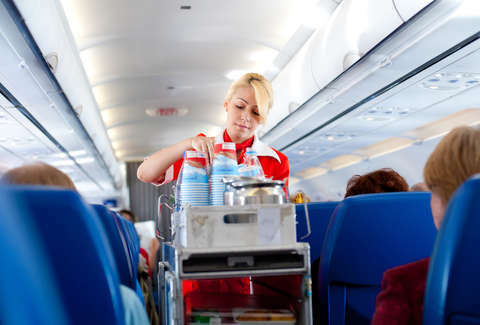 As of January 1, however, they’re done with pooling -- each flight attendant will get to keep their individual tips for themselves, according to a report by Bloomberg. While Freed noted that leaving a gratuity is entirely in the hands of airline passengers, flight attendants will also have some say. At Frontier, purser’s can choose to trigger the tip option -- and why wouldn’t they? The Association of Flight Attendants, which represents Frontier’s employees, initially objected to the introduction of tipping in 2016. Their reasons for doing so were noble. The AFA accused Frontier of introducing the option instead of hearing out flight attendants who simply wanted higher wages for their work. “Management moved forward with a tipping option for passengers in hopes it would dissuade flight attendants from standing together for a fair contract -- and in an effort to shift additional cost to passengers,” AFA President Sara Nelson said in an email to Bloomberg. Frontier’s crew aren’t the only ones who are anti-tipping, and it’s not because of the cost. Frequent traveler Henry Harteveldt, who founded Atmosphere Research Group, said he fears the new policy could cause flight attendants to see their income drop drastically as compared to that of their peers. He noted that it may also affect service on board, due to disparities between high-tipping flyer and those who give less or opt out all together. Although the AFA, and those it represents, were against the introduction of the tipping option, they did press to be able to keep their individual tips rather than split them among the entire crew. Nelson said they made this decision to allow for “better transparency” and avoid issues with distribution of gratuities. Frontier has not disclosed how much its team is making in tips each month, but Freed claims flight attendants have earned “millions of dollars” over the past three years as a result. The AFA did not dispute that estimate, but continues to negotiate with Frontier for better pay for its flight attendants. If tipping your flight attendant on top of already-expensive plane tickets, bag fees, food, and drinks sounds like a bit much for you, don’t worry -- it doesn’t seem like similar tipping policies are landing at other airlines any time soon. But, hey, sometimes it’s worth it to shell out a little extra cash as a thank you for a job well done. Especially considering what happens on planes these days.